Looking dapper in waistcoat, vest and long pants William Bonnett entered The Menagerie stage with a flair and elegance suggestive of a cool-box environment, rather than showing any signs of its true reality; a quickening 40+ degree sauna tent! LEO is a one-man production that plays with illusions, imagery and humour as skilfully as it does the interplay of physical strength with simple props and backdrop. Bonnett and his ‘room’ are projected on a screen to the side of the actual set, but at a rotation of 90-degrees clockwise. To put it another way, the right side wall that LEO has his feet propped on becomes the projected floor. Bonnett does this so effortlessly, and at such perfect angles, it is easy to forget the extraordinary muscle control he must be exerting to maintain his neck and shoulders at such an alignment, let alone the arm strength required to hold his unwavering body at right angles to the ‘wall’. What appears on the screen is a wonderful sequence of suspended, flying, dancing and cheeky movements reminiscent of a mish-mash of Mr Bean and Charlie Chaplin mime, and one of those quirky stop-motion scenes in a David Lynch film. 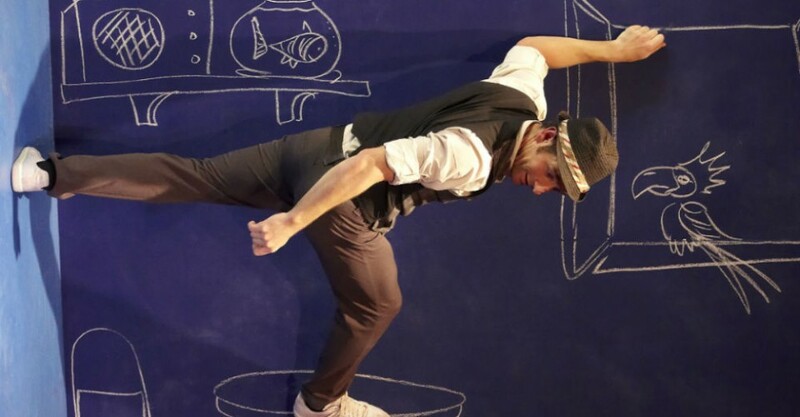 The show builds gradually with other interactive characters created on a chalkboard back wall, as well as cleverly choreographed digital projections and echo images. Some sequences were a little long but overall LEO successfully maintains audience focus due, in no small part, to the pure physical prowess and natural charm of Bonnett’s performance. Director Daniel Brière incorporates visual humour and perfect comic timing to make this one of the most unique performances of any Fringe. All the cliches are pertinent; LEO will appear to ‘defy the laws of gravity’, and will mess with your mind in a most delightful way. A must see! LEO continues at Royal Croquet Club’s The Menagerie until Sun Mar 15. LEO will mess with your mind in a most delightful way. A must see!